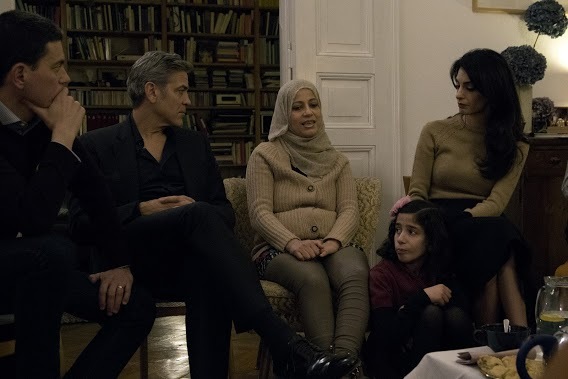 Berlin, February 12, 2015 – George and Amal Clooney today joined International Rescue Committee (IRC) President and CEO David Miliband to meet with Syrian refugee families in Berlin. The meeting took place after their discussion with German Chancellor Angela Merkel. 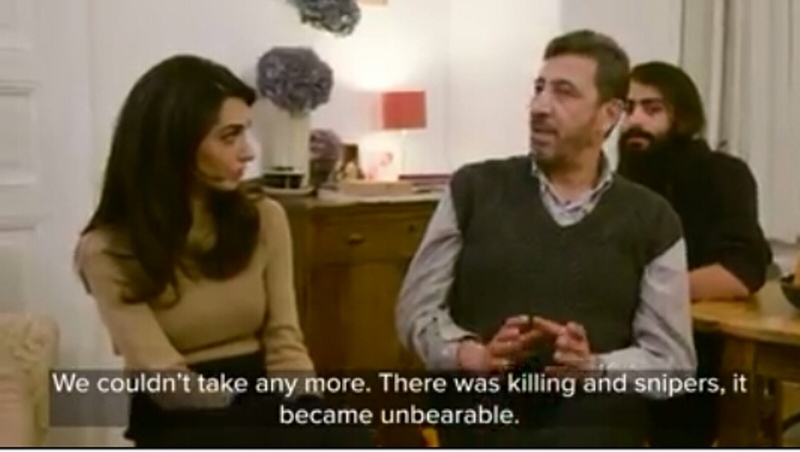 The group discussed what their life was like in Syria, the reasons they felt they needed to uproot their families, and their futures in Germany. 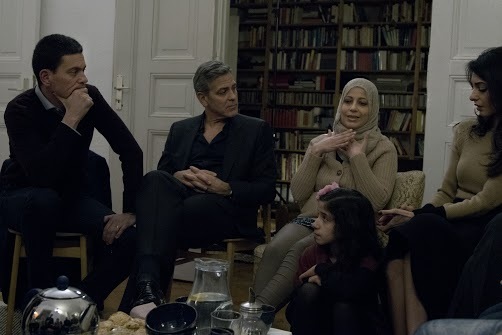 “It was an honor to meet three Syrian families whose lives have been shattered by war and inspiring to learn that the people of Germany are helping them put their lives back together,” said George Clooney. “As peace talks hang in the balance, the stories of these families should drive not just humanitarian help, but renewed determination to bring the Syrian war to an end,” added Miliband. The IRC has been delivering vital aid to those affected by the Syria conflict, which enters its sixth year next month, inside Syria and across the region since 2012. 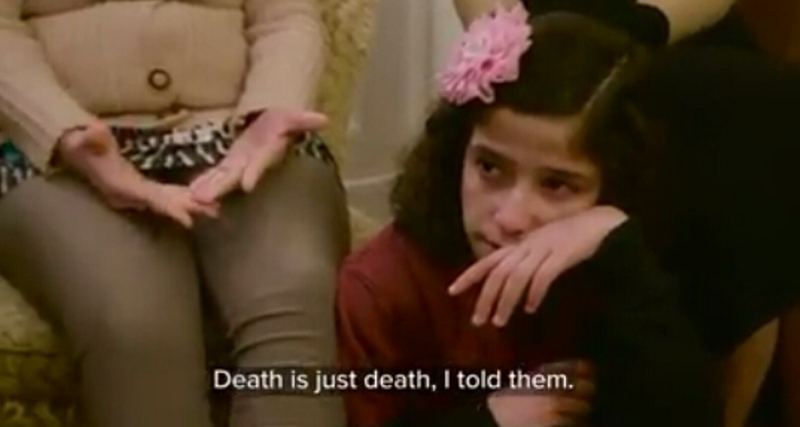 Last year, the IRC provided lifesaving assistance to nearly 900,000 people in northern Syria. I love the fact that she’s doing something that helps others… But I would find it really hard to turn up to visit refugees wearing thousands of pounds worth of clothes. It doesn’t sit well with me. I do some volunteering and legal work at the jungle in Calais and I don’t go dressing ‘down’ because that’s just patronising, but I do try to wear something nondescript. That’s just me. from the picture she looks like she is wearing a regular sweater, what do you want her to wear? scarf!! Vera: I agree. I amazed at the critical comments about what Amal chooses to wear for just about any occasion. Some commentators have even gone so far as to tell her where she should shop for cheaper clothes. Oh yeah just a regular sweater costing 1000 dollars… Granted as with most designer gear you can’t tell that someone would pay that much for it, but it doesn’t change the fact that whilst talking to refugees who have given up all of their worldly possessions you just casually flaunt your disposable income. 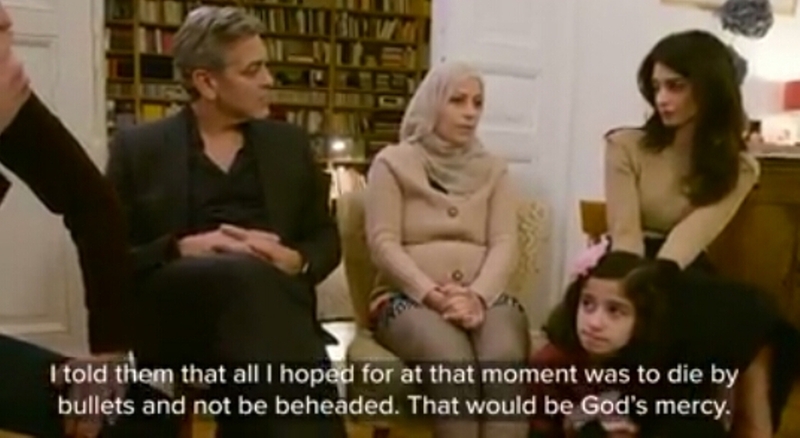 I am sure Amal isn’t thinking about it like that, but that’s the impression it can give. How can people, who wear clothes worth between 3.000 and 10.000,00 € per day and every day others, involve in our politics and tell us Germans, we should support the refugees further on. Of course we will do that, But everyone here saw it already on the salary chit – January 2016 – that the taxes increased. That means for a lot of People – salary income Germany average = 2.000,00 €, that they have to think over, what they can afford. As a millionaire with a fortune of approximately 200.000 Million USD, it is very easy to act like that. The burdon has to be carried by People with little income. 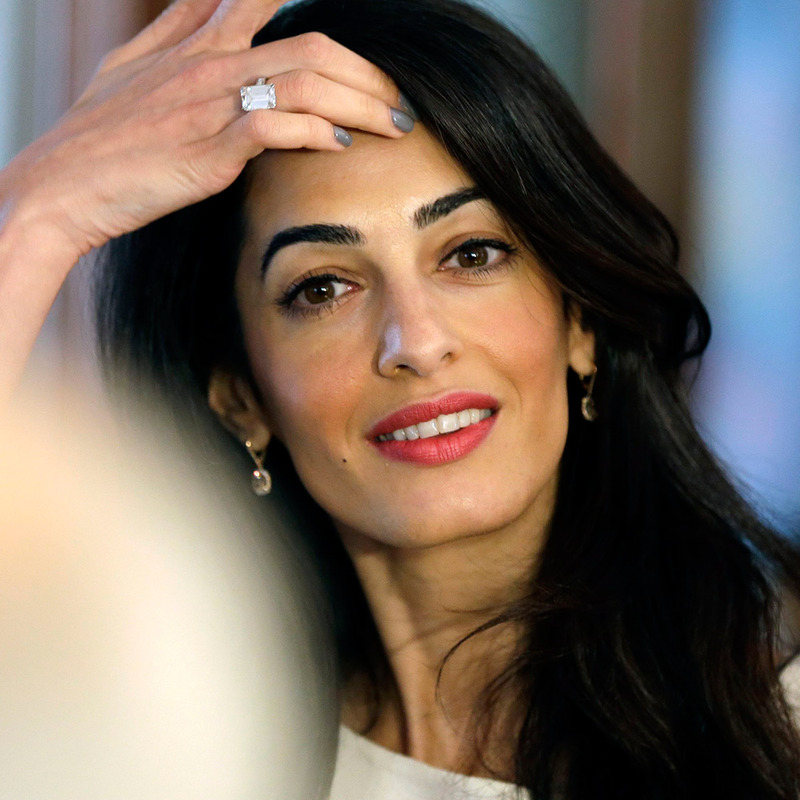 Phvdh: Why do you care what Amal chooses to wear? I simply do not get why you or others care. Amal’s choices are really none of our business. As for mentioning dm, that is a gossip column where much of what is reported is made up. Most of the respondents to the column are vicious. Curious. Isnt this blog made up of readers who care about what AC chooses to wear? Or have I been labouring under a misapprehension this entire time? I think what Jackson means is that why do you care *how much* it costs, and I don’t understand the concern for it either. I’m sure Merkel’s outfit is expensive too, but we just don’t know how much it costs because no one really cares (she’s also known to wear the same type of outfit too). Fact is, unless you’re also that poor, EVERYONE’S clothing will be more expensive. Why don’t Jaclyn and others give their life savings and open up their homes to refugees too? Maybe they should only shop at Goodwill too. Or wear robes like St. Francis of Assisi. Why don’t they do that? Amal can be beautiful in anything, but she wears whatever she wants that she feels good in. Not sure what the problem is here. And frankly, dressing “down” to meet with someone is patronizing and condescending. Imagine knowing someone put on cheaper clothing to meet with you? “Oh, look, I’m *empathizing* by wearing cheaper clothing, just like you!” (Imagine if I did that whenever I traveled to South America to meet relatives!) No, how about taking action and helping? That’s the important thing here and that’s what she’s trying to do. Jackson, normal i Love Most of her clothes and i do not mind, what she is wearing, but i See too much misery even here in Germany, one of the richest countries of the world. I really do not want her to wear rags, but for the visit to People, who own nothing, who lost everything, a simple Outfit would have been perfect. Just my opinion. Can you all just get real please! Maaariah, to help the poor you have to be poor? To help the destitute you have to be destitute? Etc. Which means that if you are rich and want to help the poor according to Maaariah you have to (at the very least) dress poor? Never mind that nobody will listen to a poor nobody from nowhere you have to be pretentious according to Maaariah. Grow up please and get a brain (or at least one cell alive). Perhaps we are all quite nervous because of the extremely dangerous situation for Europe and perhaps for the whole world. What do you want her to wear ? Seems that too many people ‘cant see the forest for all of the trees’! People in need just want to be helped…doesnt matter to them if the person doing it is a king or pauper. All those refugees will care about is that they matter to someone – be it Amal (no matter what she wears) or some one else. Amal clothes don’t have price tags on the how would these people know how much they were. I think the refugees could care less how much her clothes cost the fact that she and George were there and interested in them is what mattered. women need to get over the it costs too much bull she is wealthy and as such wears what she likes. Her actions and work speak louder than the price tags on her clothes. If no gossip site spoke of what she wore no one would be the wiser. Angelina Jolie wears expensive clothing but no one says a word she is no better than Amal yet Amal gets this grief because she married George. 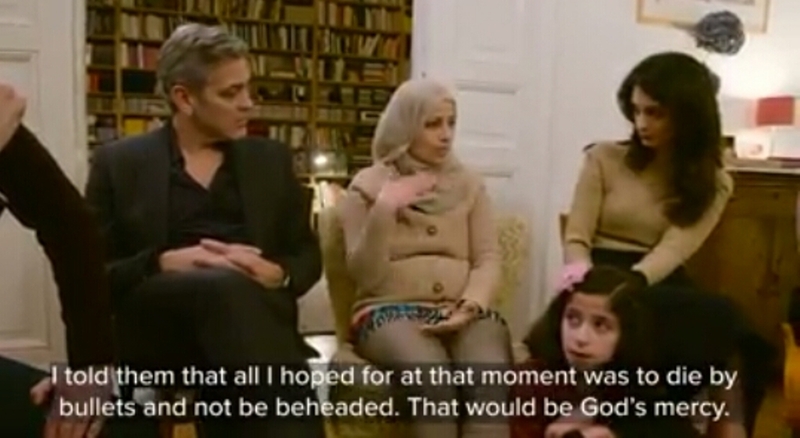 I expect a sizable donation to the refugees from George Clooney who seems to be humanitarian.